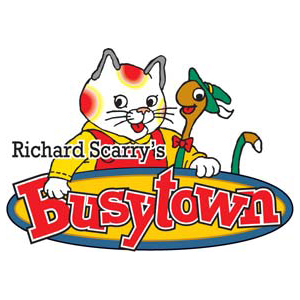 “Big day today!” is how the characters greet each other in Busytown, Richard Scarry’s vividly drawn world. As the day unfolds, Grocer Cat, Stitches the Tailor, and Alfalfa the Farmer tell of their jobs in silly songs and scenes. One catchy number explores vehicles from the Broom O’Cycle to the Pickle Car, another, sung by Able Charlie Baker, describes goodies from donuts to biscotti, and there’s even a sea shanty from Captain Salty. Young children love to see their favorite animal characters brought to life while older siblings enjoy this tuneful trip down memory lane! Adapted for the stage by Kevin Kling from the book What People Do All Day by Richard Scarry. Copyright © 1960 by Richard Scarry. Copyright renewed 1996 by Richard Scarry II. All rights reserved. Music by Michael Koerner. Lyrics by Kevin Kling and Michael Koerner. Originally commissioned by Seattle Children’s Theatre, Seattle, WA. Produced by special arrangement with Plays for Young Audiences, a partnership of Seattle Children’s Theatre and Children’s Theatre Company - Minneapolis. Production sponsored in part by the La Jolla YMCA, the City of San Diego Commission for Arts and Culture, the City of San Diego Park and Recreation Department, and the County of San Diego.